So, on Cinco de Mayo, I might have gone a little crazy… okay, really crazy. We love Chevy’s Fresh Mex, but the nearest one is a 30 minute drive from here, so we rarely go. I had found a bunch of recipes online months ago but hadn’t tried them… for some reason, instead of trying them, oh…one at a time… I went for 4 in one afternoon. I tend to go on cooking binges when I’m stressed and Cinco de Mayo weekend was at the start of pretty much most stressful month I have ever had at work….but that’s another post. I mentioned in a previous post that since my mom’s stroke over 2 years ago, I’ve lost my taste for certain processed foods. Something that I’m sure is psychosomatic, but it’s there nonetheless. One of these has been canned refried beans. I found this recipe, and despite my lack of faith in the crock pot, I decided to try it. And I am so glad I did!!! These were delicious! All you need is dried pinto beans, water, chicken bouillon, half an onion, garlic salt, and several hours. Once the beans are soft, you add some butter and use one of my all time favorite kitchen gadgets, the hand blender, to smash them up. I also added a bit more garlic salt to taste. These were the second best beans I have had (First belonging to Las Fuentes in Reseda, CA). 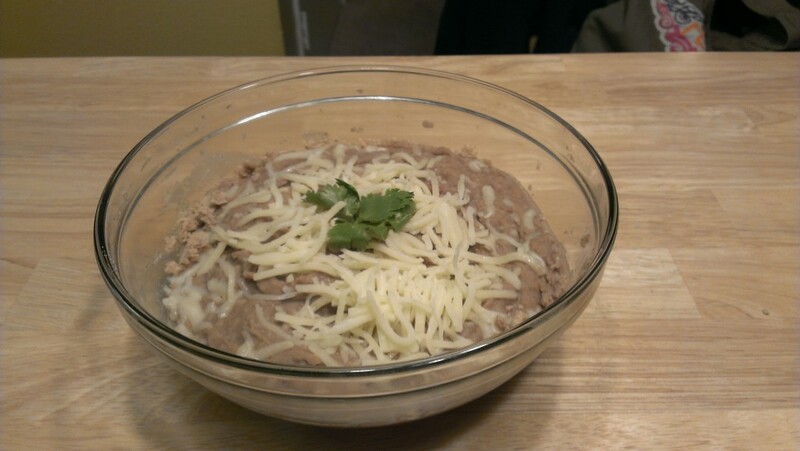 I will absolutely make these again, reduced though as we had apparently refried beans for 50… we ate a lot of mexican food that next week. Also, I used what I learned from this recipe to make some awesome “refried” black beans using canned black beans. I only drained off maybe half the liquid and used the blender to smash them with some garlic salt and cumin. They were yummy and Matt really loved them. 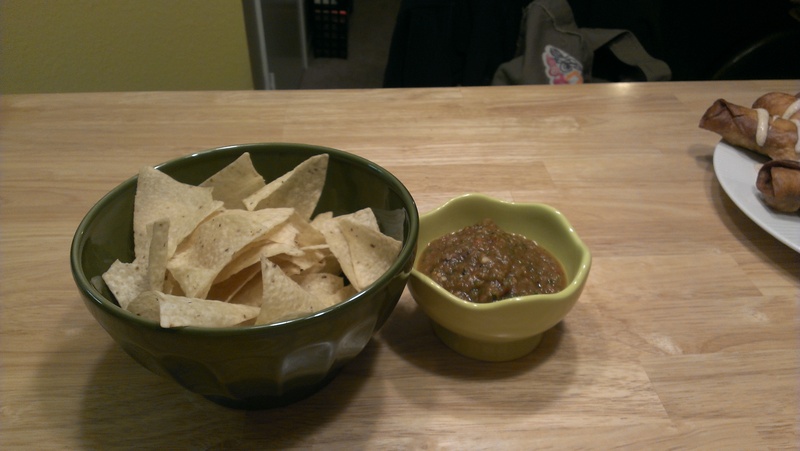 This was very similar to another salsa recipe I tried last year, but less heat. You roast the tomatoes, onions, and peppers in the oven before pureeing them with some garlic, salt, and pepper. It was okay salsa, but it was missing something and seemed a little flat. Matt suggested some lime juice and that did brighten it up a bit, but it still wasn’t right. Chevy’s really does have the best chips and salsa, and while Tostitos Cantina Chips come close, I still haven’t found a salsa that can match Chevy’s. Frying has been something that has scared me for many year. After gaining more experience and confidence, and Matt’s lovely gift of a heavy duty dutch oven for Christmas, I have slowly been trying frying, first making these wings (which were AWESOME. Highly recommended!). That had honestly been what was keeping me from trying this for awhile, that and the pepper jelly which was a necessary side dish. Both of these recipes were AMAZING! As in, thinking about them right now is making me frustrated that I don’t have any to eat! 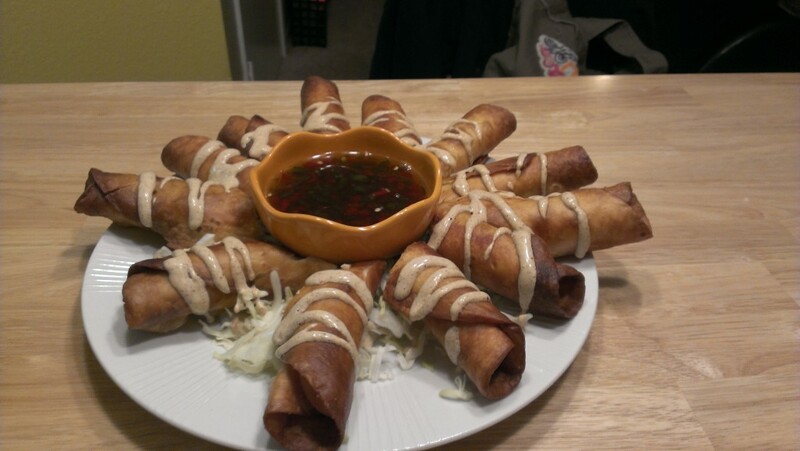 The flautas were fairly simple to make, even with the scary frying. I added corn to the mixture because I thought I remembered that Chevy’s did as well and it wasn’t in the recipe. Correct or not, it was a good addition, adding some sweetness. Matt was SO impressed with these and said they were ever better than Chevy’s. We did make these again the next night since I had tortillas and filling left, this time though we brushed them with oiled and baked them. They were good, the filling is identical so you keep all those flavors, but they weren’t as good. For me, the appeal to flautas is the blend of textures, the crunch giving way to the more chewy when you bite into it. You don’t get that with baking them. So I’m very happy I have kicked my frying fear! The jelly? Okay, totally honestly, the pepper jelly is WHY Matt and I order the flautas. It’s sweet, spicy, sticky, and all around amazing. We adore the stuff! This recipe, is a SPOT ON replica. My only comment is that it might have needed more gelatin as it was a little more runny than Chevy’s but that didn’t matter because it tasted AMAZING! I knew it was promising when I put it aside to cool and caught a whiff and it smelled SO GOOD. So good, that I called Matt over to show him how excited I was. Waiting for it to cool was a test in patience. Thankfully, having experienced the culinary napalm that is liquid sugar (that sucked, let me tell you), I was willing to take the time to make sure it was cooled sufficiently. Then I resisted eating it with a spoon! I really need to figure out what else to put it on! I’m so happy that I now have these recipes. Matt said it was the best meal I have ever cooked for him! I can’t wait to make them again. Although, I probably won’t make them all at the same time again…except for the flautas and jelly because that is just required by law. Posted in 100 New Recipes, Jess General. Tagged with beans, Chef in Training, Chevy's, chevysfreshmexathome.blogspot.com, Chicken, Copycat, crock pot, fireandsalt.blogspot.com, Flautas, Foodiemob, frying, mexican, Peppers, refried beans, Salsa, Torillas.